Movies have become such a huge part of our lives that we end up watching countless films in our lifetime. Despite the number of scenes we’ve watched, there are still some that can stand the test of time and remain engraved in our minds. The Breakfast Club has been heralded by many as one of the best teen movies of all time. Many of us remember the final freeze frame where Bender pumps his fist in the air. Who can forget Audrey Hepburn munching on her bun in front of a Tiffany & Co. shop window? That memorable scene from Breakfast at Tiffany’s has become an iconic part of cinema history. In this quiz, we’re going to test your movie memory! Look at the screencaps of popular movies over the last 20 years of cinema. Your task, if you choose to accept it, is to identify the movie the shot is from! If you manage to beat this quiz, you’re a true movie genius! Which 2018 movie is this screencap from? Pick the 2017 movie this scene was from! Do you know which 2016 movie this scene took place in? Would you happen to know which 2015 movie this is from? Can you remember the 2014 film this screencap featured in? Which 2013 flick can you see this scene in? Choose the correct 2012 movie that this is from! Do you know the name of the film from 2011 that includes this scene? Have you watched a 2010 movie that features this screencap? Do you remember a 2009 movie featuring the moment below? Have you watched a 2008 film with this scene? You get a gold star for that! Can you tell which 2007 flick is this from? Which 2006 movie does this scene feature in? Where can this moment be seen? Pick the correct movie from 2005. Do you know which 2004 film is this screencap from? Can you remember where you saw the screenshot below? Choose the right 2003 movie! You must have watched this scene from a 2002 movie before! Do you know the name of the 2001 flick with this scene? Which movie, released at the start of the new millennium, was this scene from? Finally, do you know which 1999 film this screencap was from? 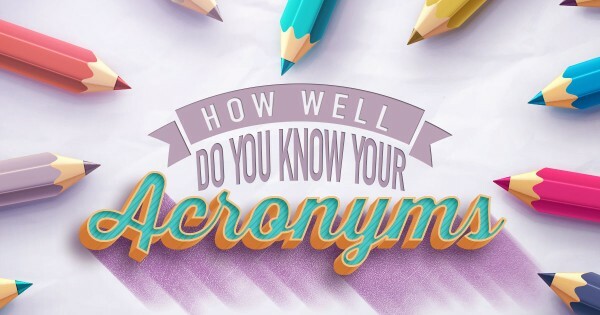 How Well Do You Know Your Acronyms?